September is crazy busy at our house and I know that I need to plan ahead in order to remain sane. My job is always demanding, but September is generally off the charts in terms of work load. I tend to put in very long hours and bring quite a bit of work home with me as well, so I always need to try to get life at home organized in preparation for the pending mayhem that will follow in the weeks ahead. I have found that menu planning really helps. I must say, that for me menu planning helps to keep me organized and takes the stress out of deciding what we should have. Often at the end of a long day, it is not so much the making of dinner, but rather making the decision about what to have. With the menu, I know what groceries need to be bought and what needs to be taken out of the freezer the night before. Sometimes I will even do a few make-ahead meals and freeze them for those evenings when we are on the run to activities and such. Some simple make-aheads are cooked ground beef (used for tacos, soup, spaghetti sauce, etc). I sometimes will make double batches when cooking the week before school starts and during the school year. By doubling things up, I always have leftovers to freeze for future meals. I have to admit we don’t always stick completely to the plan, but it provides a great frame-work for most of the meals throughout the month. We don’t use a monthly plan every month, but always in our busiest months of the year (September, December and June). I have used several variations. When setting up a menu, I try to consider a few things: our favourites, variety and a good balance of healthy choices. (I am still following The Plan and have not done much food testing this summer, so I am planning family meals, but may not always be eating the same meal as the rest of the family.) This year, I decided to make up a menu with no dates, but rather planned by week #’s. I plan to use the calendar grid and make 6 full week plans that we will work through (and tweak as we go). This way, we can just keep following the weekly rotation and then begin again when we’ve gone through all of the weeks. I have a weekly menu board in my kitchen that I update every Sunday and follow throughout the week. 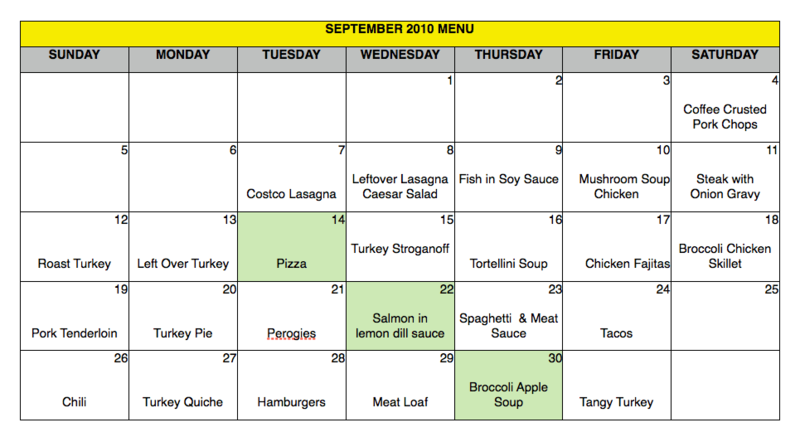 I am still tweaking the new 6 week menu plan, but it will be a combination of some of our meals from previous years as well as a few new favourites. I plan to have “grilled chicken breast with salad” every Thursday. This is a really clean, healthy meal. I plan to place it on Thursdays because Friday is a bit of a fun food day at our house. When we have salad and chicken breast, we use different variations of chicken (ie different sauces, BBQ, oven baked, etc.). We also change-up the salads to add variety. I also usually cook a pot of homemade soup on Sundays (especially when the weather gets colder). I love having homemade soup on hand for lunches throughout the week. The other thing that the menu does not take into account is left-overs. I sometimes find that we will skip the pre-planned meal and just clean-up the left-overs in the fridge. In a previous house, I had two long narrow pieces of sheet metal cut for the inside two of my cupboard doors. I loved this as it got all of our little notes and business cards off the fridge door and hidden inside the cupboard. Unfortunately, the style of our new kitchen cupboards would not support the magnetic boards. 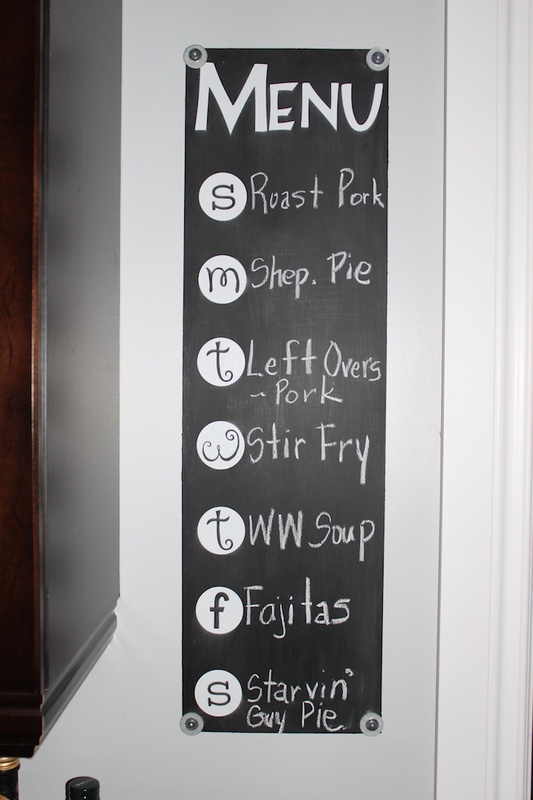 I decided to use one of them for a chalkboard/magnetic menu board in my kitchen. I thought that the magnetic feature would be great, but in hindsite, we never use magnets on it, so it is a waste of a good piece of metal. I wish I would have used wood and saved the metal for another use. Having said that, the menu board itself is well used and works well. To make this, I primed the metal and then gave it 4 coats of my homemade chalkboard paint. You must let it dry completely and give it a very very light sand between coats. After the final coat, let it cure for a full day or more. In the mean time, I used my Cricut to cut out the lettering for the board out of white vinyl. It is basically peel and stick vinyl, so easy to do if you have a Cricut machine. If not, you could purchase letter stickers from the craft store. I adhered the stickers to the board BEFORE priming the surface for using chalk. This helped to ensure better adhesion of the stickers. I then primed the surface using the side of a piece of chalk and then erased it completely. I chose to mount my menu on the wall right beside my stove. 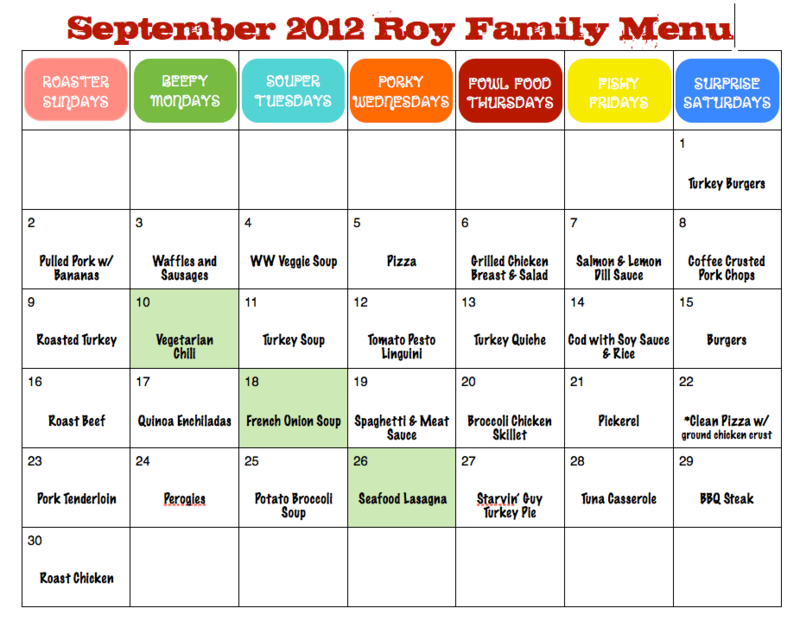 I really like it and it allows me to make modifications to the monthly menu for the coming week. For example, if we are going to be out for dinner one night, our menu would reflect this. Here is the weekly menu board. Posted on August 25, 2013 by Cindy Roy •	This entry was posted in DIY and Upcycling, Organization and tagged chalkboard menu, DIY weekly menu, getting ready for school, menu planning, monthly menu planning, organization. Bookmark the permalink.